I’ve been researching several park topics lately in archival newspapers and stumbled across peripheral incidents that made me double-check the date of publication. These aren’t directly park-related, but fascinating if you’re interested in the arcs of history. I consider myself an optimist, mostly because I think our kids are smarter than we are, but sometimes you wonder whether we learn. See if you can guess when these events occurred. Minneapolis’s Health Officer made a concerted effort to vaccinate more citizens against a potentially lethal disease only to be opposed by activists who claimed the vaccine was more dangerous than the disease it was meant to prevent? Hall said he had two job openings at the Minneapolis quarantine hospital and he invited the anti-vaxers to provide two workers for those jobs who had never been vaccinated to measure their health against the rest of the staff, all of whom had been vaccinated and had not contracted smallpox. The offer was declined because the jobs were for a laundry worker and a housekeeper at low pay. The Tribune opined that the city attorney would never have allowed such an experiment to go forward anyway. Hall claimed that of the 1000 patients who had been treated at the smallpox hospital only five had been vaccinated and four of those probably had been vaccinated incorrectly. Hall estimated that 70-80% of Minneapolitans had been vaccinated at that time. The argument raged for much of the winter of 1902 with the Minneapolis and St. Paul newspapers carrying multiple articles many days on the disease and the debate. Editorially all the papers sided with Dr. Hall. A woman who was verbally accosted in downtown Minneapolis asked a policeman to arrest the man for assault. He did and the next day she testified about the incident in court and the offensive man was given 20 days in the workhouse for disorderly conduct? Are we closer to that day? An influential group of Minneapolis business people urged Congress to secure a commercial treaty that would facilitate free trade with Canada? We’ve known trade barriers were a bad idea for quite a while. Minneapolis threatened to charge property owners for shoveling their sidewalks if they didn’t do it themselves. The most famous case of refusing to shovel was the eccentric millionaire lawyer Levi Stewart who lived on the corner of Hennepin and 4th. He claimed it was the city’s responsibility to clear the walks the same as it was to clear the streets. (The city had sued Stewart in 1871 to force him to put in a sidewalk—which were then made of planks—so he considered it the city’s responsibility to maintain it.) An article in 1885 claimed slippery sidewalks were a particular hazard at Stewart’s property because the fence he put around his yard was made of barbed wire. Minneapolis had tried to create a shoveling ordinance in 1891 but due to technicalities it had to be rewritten. In 1897 Stewart suggested that they take the issue to the courts again to determine the legality of the rewritten ordinances. The City must not have accepted Stewart’s challenge then because in 1905 a Journal editorial urged the City to take Stewart to court to test the new/old ordinance because he still wasn’t shoveling his walks. That’s as far as I’ve gotten into investigating that particular argument between Stewart and the City, there were many others, but I hope to tell much more in a forthcoming longer piece on Levi Stewart. I saw what looked like a city crew out shoveling and plowing a sidewalk in my neighborhood this week in the most recent crackdown on snowy walks. While snow-covered sidewalks might not be in the same category of threat to the common good as infectious disease, verbal assault and protectionism, accessibility is a much more serious issue today than 120 years ago—and evidence of how public opinion and policy have changed significantly over time. Let’s go down to the river one more time. 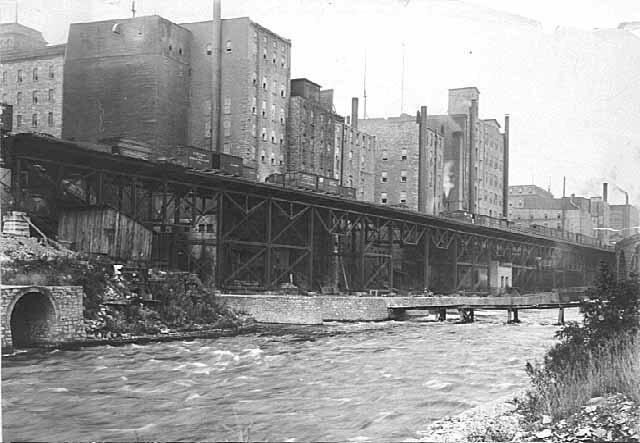 I have many favorite pictures of the riverfront when it was the economic engine of Minneapolis, but this is probably at the top of my list. 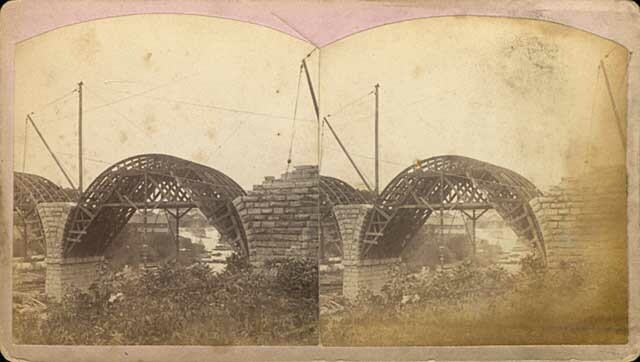 You can see just a dash of the still-new Stone Arch Bridge on the right margin of the photo. 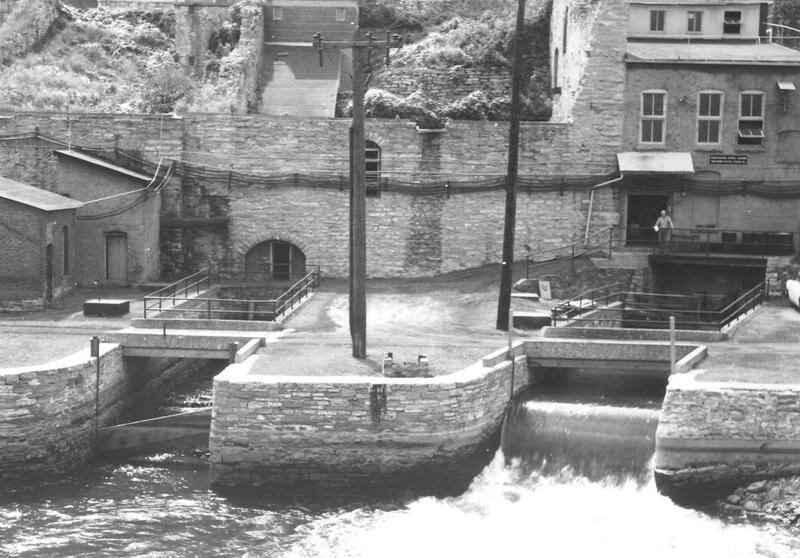 The channel here is all tail race — the water that ran out of the mills after generating power. My favorite part of this photo though is the trestle and railroad tracks that ran between the mills and the river at essentially the level of city streets. Those tail races coming out of the mills are now a part of Mill Ruins Park. The trestle and tracks are gone, but I don’t know when they were torn down. Anybody? Below are two shots (a 3-for-1 Friday Photo!, the biggest Friday Photo discount ever) of the tail races as they appeared probably in the 1950s. 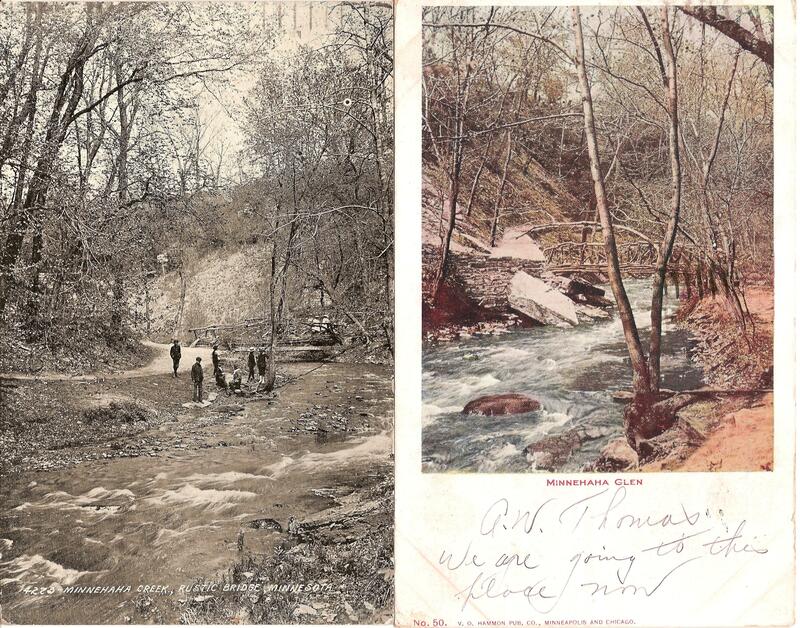 Both photos are undated. They show the water coming out of the tail races. They give a much better sense of the management of water power. I’m not sure of the functions of structures and workers at this point in the water power process. 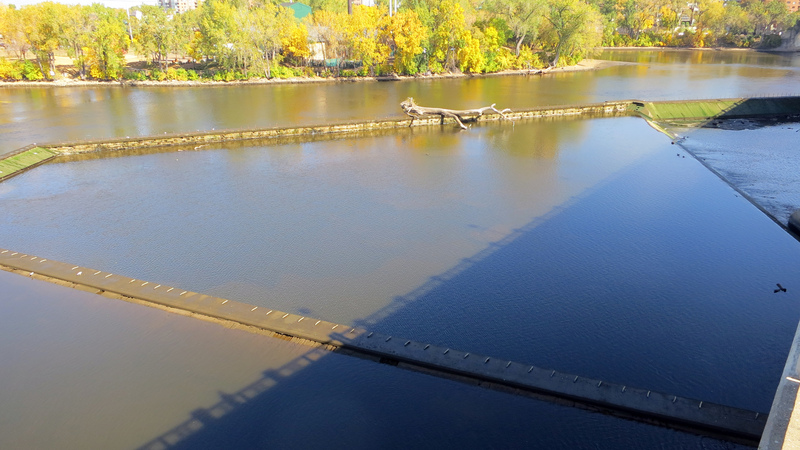 These structures were razed and covered when the Upper St. Anthony Falls Lock and Dam was built in the 1960s. For a marvelous 360-degree panorama of Mill Ruins Park and the adjacent lock and dam go here, courtesy of the National Park Service. 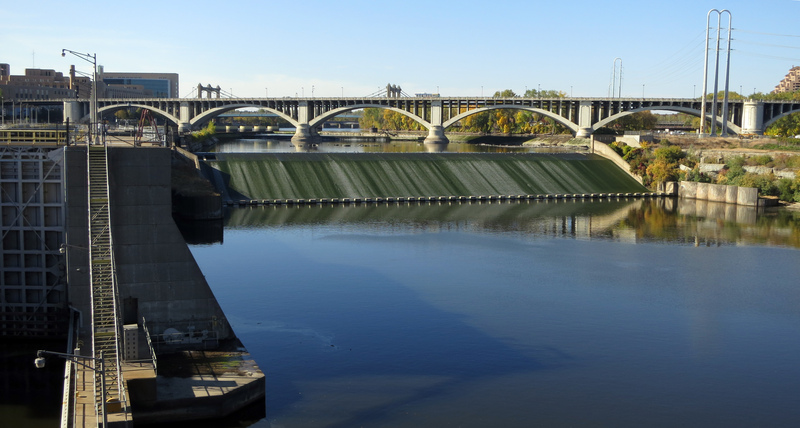 Learn much more about the lock and dam — one of the biggest mistakes Minneapolis and the U. S. Army Corps of Engineers ever made — at the pages of the Mississippi National River and Recreation Area. Have a look around the park — if spring ever comes. The transformation is amazing — and thought-provoking. The Stone Arch Bridge over the Mississippi River in downtown Minneapolis is becoming one of the iconic images of the city. Have you ever wondered how those arches were made? I have. So I found this photo of the bridge under construction. The deck of the bridge is maintained by the Minneapolis Park and Recreation Board, so let’s call it a park. Day and night the bridge provides the best views of the city. A hike over the bridge between Mill Ruins and Father Hennepin Bluffs, in either direction, is a must for visitors and residents. 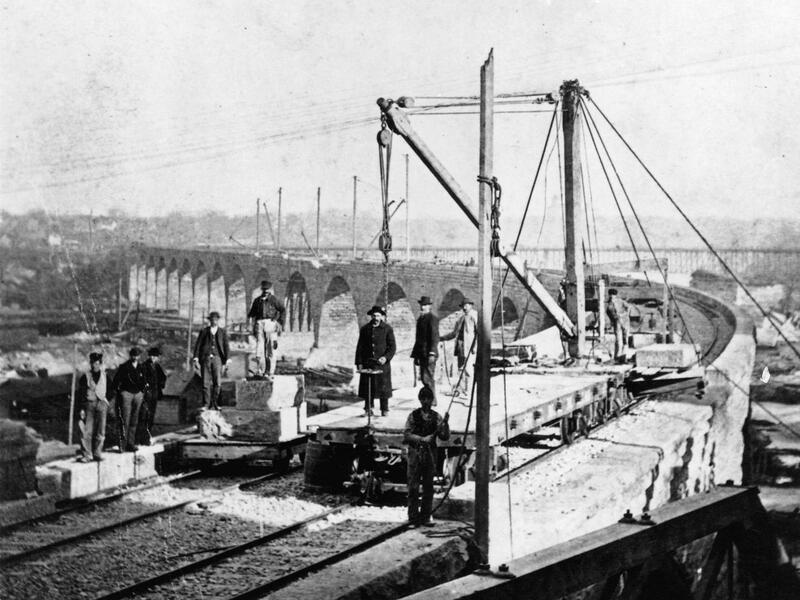 The two-track railroad bridge was being built at the time the park board was created in 1883. 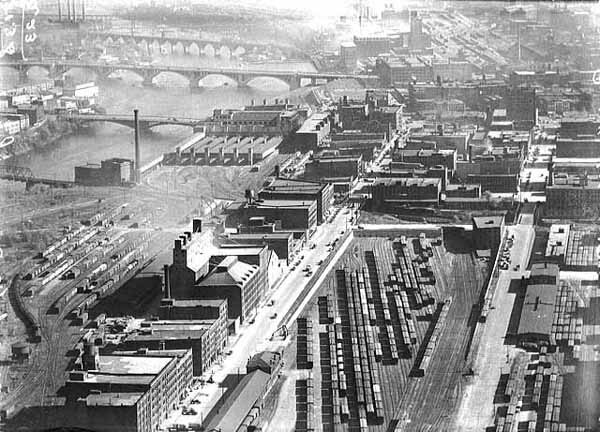 To reinforce recent articles that addressed the dominance of railroads and mills along the Minneapolis riverfront, I found these photos from about 1920 to be fascinating. Both are from the photo collection of the Minnesota Historical Society, a fabulous resource for understanding how our city and state came to be. 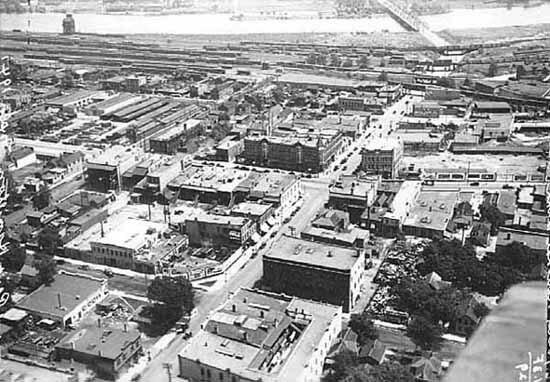 The collection includes other aerial photos by Paul W. Hamilton of Minneapolis and St. Paul from the same time. They’re worth a look. When you look at these pictures it’s obvious why the Civic Commission and the park board were interested in reclaiming the riverfront 100 years ago. The dry weather this year is evident on the Mississippi River at St. Anthony Falls. A couple weeks ago I posted an aerial photo of St. Anthony Falls when it was very dry in 1955. The water levels on the river appear to be similar now. Larry Dillehay sent this photo taken on the afternoon of October 2. The concrete apron at the Falls isn’t quite dry, but there’s not enough water flowing to make a ripple at the bottom. The horseshoe dam above the falls is now completely out of the water. What a gorgeous day—again. 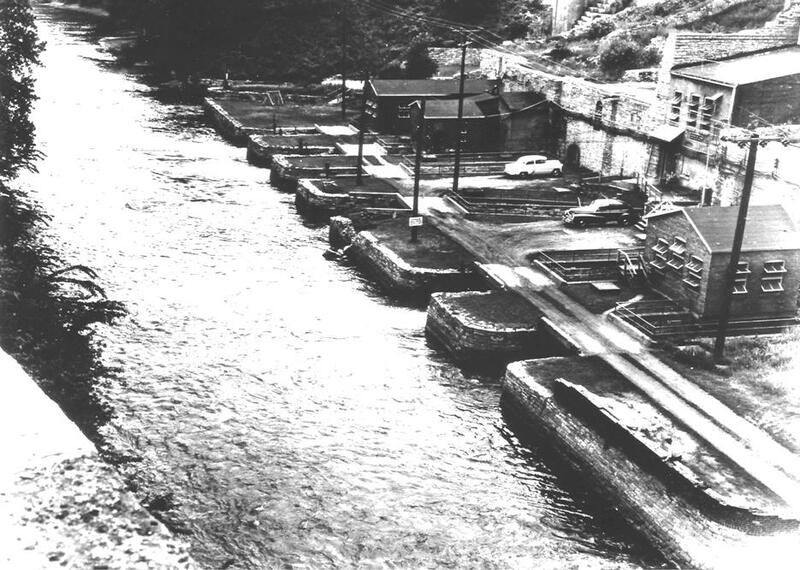 Postscript: Both the horseshoe dam and Lock and Dam #1, or Ford Dam, were repaired while the water was at this level, suggesting that while the summer had been very dry, the water levels had been lowered intentionally by the U.S. Army Corps of Engineers to facilitate mainteneance. Outlawed: The possession or sale of heroin, other opium derivates, and cocaine without a prescription. Penalties established of $50-$100 fine or 30-90 days in the workhouse. Minneapolis City Council Proceedings, October 10, 1913. Approved: Spanish language classes for Central and West high schools. Existing faculty at each school will teach the classes. Action of the Minneapolis School Board reported in the Minneapolis Tribune, January 13, 1915. Suggested: A cement wall between Lake Calhoun and Lakewood Cemetery if the city would continue to permit ice to be cut from the lake. From Minneapolis Journal article, June 8, 1901, about the visit to Minneapolis of Dr. Henry Marcy, “the eminent surgeon and philanthropist of Boston.” Dr. Marcy made the suggestion when he visited Lake Calhoun with Charles Loring. He said he had heard a great deal about Minneapolis’s parks and had a Minneapolis map on which he had sketched out their locations, but wanted to see them. Found: Gold in Hennepin County, the best sample near Minnehaha Park. The specimen recovered by Prof. J. H. Breese, a former professor at Eastern universities, was confirmed as gold by state geologist Prof. N. H. Winchell. Prof. Breese believes the particles were carried from higher latitudes during the drift period, “but he is quite confident that all has not yet been found.” Reported by Minneapolis Tribune, July 17, 1889. Beavers invade Minneapolis park near University of Minnesota! That’s the gist of my favorite, undated newspaper clip from Victor Gallant’s scrapbook: Minneapolis Parks, 1923-1949. The article had to be from the late 1940s, I’ll tell you why in a moment. 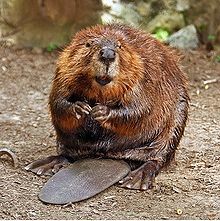 That’s the first and last I’ve heard of beavers in Minneapolis. I suspect they didn’t stay long. I’m pretty sure that the article appeared between 1945 and 1949. It had to be after Doell became Superintendent in 1945 and before Gallant quit keeping the scrapbook in 1949. But I didn’t need to know that was the end of Gallant’s newspaper clipping to figure out that date, because it was in 1949 that the University and park board signed a ten-year agreement for the U to use the river flats as a parking lot. I’m guessing that the beavers wouldn’t have settled next to a busy parking lot. And if they had, everyone would have been happy to evict them if their gnawing was endangering cars instead of just trees. Nobody wants a cottonwood in their back seat, even if its young. The U’s lease of the parking lot kept being extended beyond the original ten-year term. The park board didn’t take back the land for a park until 1976! Some cottonwood trees only live about as long as that lease lasted. Do you know the official name of the park where the rodents lived for a while? It rhymes with beavers. In 1894 the park board named the east river flats “Cheever’s Landing,” after the man who operated a ferry across the river there. I don’t believe the name ever has been changed officially. 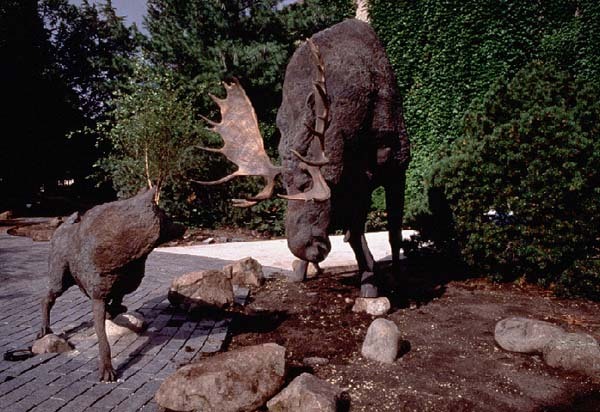 And speaking of wildlife and the James Ford Bell Musuem of Natural History at the University of Minnesota, the coolest sculpture in the city is the wolf pack attacking a moose near the entrance to that museum. Worth a visit. Don’t jump when you see them. 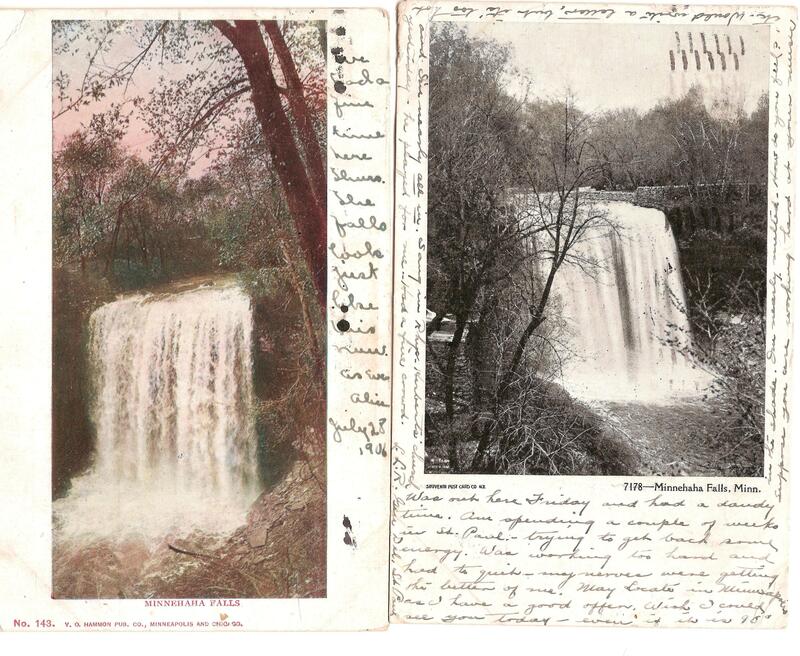 I found these postcards in a lot box at an auction. They intrigued me because I work for the park board. What I liked about them was that we always think that the world changes so much, but here was proof that we are still enjoying the exact same activity (having fun at Minnehaha Falls) that people did over a hundred years ago. Kind of reassuring in a crazy world. 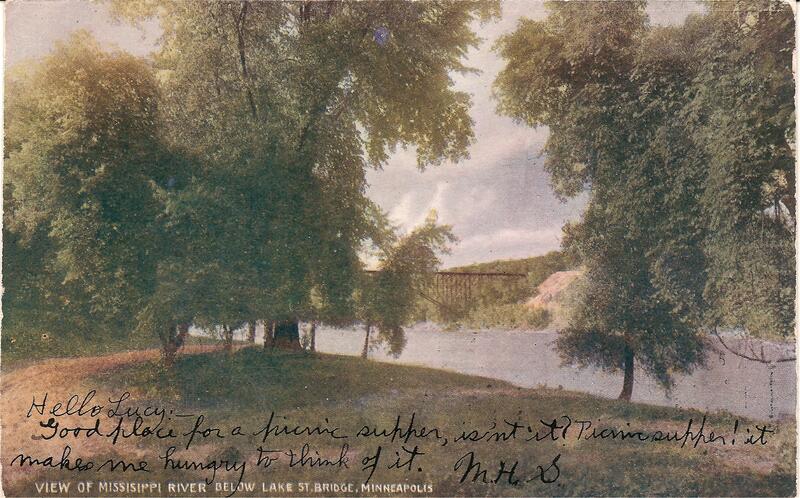 West bank of Mississippi River with view of Lake Street bridge in 1908 postcard. This was the river bank before the Ford Dam created a reservoir of the river.